The classification of Cretaceous rocks in Northern Ireland dates from 1786 when Whitehurst (1786) made comments on the outcrop using the term “White Limestone”. Sampson (1814) demonstrated that this White Limestone was underlain by a sequence of greensands, conglomerates and marls. Essentially, these workers established the two-fold division of the Cretaceous. Portlock (1843) suggested three divisions of the strata introducing the terms Upper Chalk (equivalent to the White Limestone), an intermediate unit the Lower Chalk (Glauconitic Chalk) and a lower unit termed the Greensands. Bryce (1853) divided the ‘greensands’ into three, and this three-fold division was also recognised by Tate (1865) [Fig.10/1]. The work of Tate was the first appraisal of the faunal and lithological characteristics of the full Cretaceous sequence and its comparison to the English and French schemes. In his appraisal of the biozones present he recognised that most of the Middle Chalk of England was unrepresented in Northern Ireland and reverted to a two-fold division of the strata into the “Hibernian Greensand” and “Upper Chalk” ‘Formations’. Further division equivalent to ‘member’ status formalised the terms, in ascending order, of “Glauconitic Sands”, “Grey Marls and Yellow Sandstones with Chert”, “Chloritic Sands and Sandstones”, as subdivisions of the Hibernian Greensand; and the “Chloritic Chalk” and “White Limestone” (or “Hard Chalk”) as subdivisions of the Upper Chalk (Figure 10). The development of the terminology in the Ulster Cretaceous Province. P895011. The Northern Ireland Cretaceous Province. P895013. Gault (1878) and Hume (1897) [Fig.10/2] added refinements and corrections to the work of Tate based on more extensive fieldwork. Hume (1897) produced a comprehensive description and correlation for the whole of Northern Ireland and divided the outcrop into five geographical “divisions” each with its own character, thus essentially being the first to recognise the structural control on sedimentation in the Province. He also suggested the term “Antrim Beds”, in his “eastern division”, for the Chloritic Sands (sensu Tate). Reid (1958) introduced the terms “Upper Glauconitic Sandstone” and “Lower Glauconitic Sandstone” to cover Hume’s Antrim Beds and the older Zone of Exogyra columba, thus separating the Cenomanian (Lower) from the ?late Turonian and Senonian (Upper) strata. Hancock (1961) [Fig.10/3] made a complete re-assessment of the Cretaceous of northeast Ireland. He attempted to simplify terminology and included Tate’s and Hume’s Chloritic Sands and Chloritic Chalk in his “Upper Glauconitic Beds” of the “Hibernian Greensands”. In so doing Hancock amalgamated the glauconite rich beds of post-Cenomanian age despite there being a second major diachronous break within the succession. Hancock’s Hibernian Greensands ‘Formation’ also included the “Yellow Sandstone” and “Glauconite Sands” each respectively equivalent to the Grey Marls and Yellow Sandstones and the Glauconitic Sands of Tate and Hume. Extensive work by members of the Geological Survey (Wilson and Robbie, 1966; Manning et al., 1970; Fowler and Robbie, 1961) led to a significant systematic reappraisal of the Cretaceous of Northern Ireland. The Belfast memoir (Manning et al., 1970) [Fig.10/4] offers the fullest account and maintained the White Limestone and Hibernian Greensand divisions. They further divided the Hibernian Greensand into “Cenomanian Greensands” (equivalent to the Yellow Sandstones and Grey Marls, and Glauconitic Sands of previous authors), the “Cenomanian/Turonian Greensands” (including the new terms of “Glauconitic Sands and Sandstones” and “Quartzose Sand”) and the “Senonian Greensands” (presumably equivalent to the Upper Glauconitic Beds of Hancock, 1961). 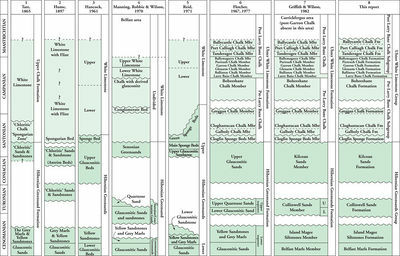 The White Limestone was divided, in ascending order, into a basal “Conglomerate Bed”, “Chalk with derived Glauconite”, “Lower White Limestone” and an “Upper White Limestone” (this latter being subdivided into four named beds). Reid (1971) [Fig.10/5] summarised the earlier papers and gave an indication of the spatial variability of the Cretaceous succession across the Province in his Figure 2. Fletcher (1977) [Fig.10/6] introduced a comprehensive nomenclature for the Cretaceous of northeast Ireland and formalised the terms of the “Hibernian Greensands Formation” and the “Ulster White Limestone Formation”. The Hibernian Greensands Formation was redefined with respect to the proposals by Tate (1865) and Hancock (1961) and he confined the term to the glauconitic sands and related clastic deposits. He excluded the ‘Glauconitic Chalk’ from the formation regarding this as a local, structurally controlled, facies of a number of his Ulster White Limestone Formation members. Fletcher (1977) divided the Ulster White Limestone Formation into fourteen members on the basis of their lithological character, correlation of marker bands and their spatial distribution (see Fletcher, 1977; Figure 8). His work is the standard for the succession mapped in Northern Ireland and is used on the subsequent maps publications on the geology of the Province. Griffith and Wilson (1982) [Fig.10/7] gave formal names to the ‘members’ of the Hibernian Greensands first defined but unnamed by Fletcher (1977). There is an argument for upgrading Fletcher’s system, elevating his members to formations permitting the introduction, in future years, of chalk and glauconitic chalk members within each of his presently constituted members. 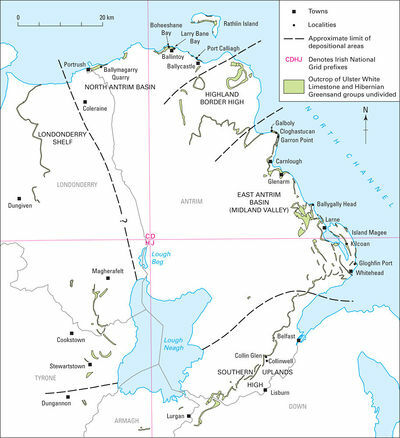 In so doing the Ulster White Limestone and Hibernian Greensands would then be considered as groups or subgroups depending on whether it was felt that an over-arching group term should be applied to the Cretaceous of the Province. The use of the term Chalk Group (in the sense of its use in England and the North Sea) would provide uniformity to the Upper Cretaceous of the whole of the UK but may not be appropriate because of the distinct clastic nature of the lower half of the succession. It is recommended herein that the terms Hibernian Group and Ulster White Limestone Group be introduced with Fletcher’s member being elevated to formation status. Within the lexicon there are only full formal descriptions for the two formations (now groups), each of the members (formations) are registered as code only. In consequence an attempt has been made to outline the main Lexicon entry-style information for each of Fletcher’s units below. Prior to this report there was no formal ‘Group’-level nomenclature for the Northern Ireland succession. The term Chalk Group could be utilised to cover all of the deposits of the Upper Cretaceous in the Province despite the lower part of the sequence being predominantly in ‘greensand facies’. However it may prove preferable, and suggested herein, to raise the status of each of the presently defined formation and member level entries to group and formation respectively. In so doing formalising the framework and permitting greater flexibility to future workers on the sequence at the member level. Table 5: The lithostratigraphical units utilised on the 1:50 000 Geological maps and within the descriptive memoirs of Northern Ireland. This page was last modified on 11 June 2014, at 11:53.